Charles Fishman author of The Big Thirst visits Fresno State! 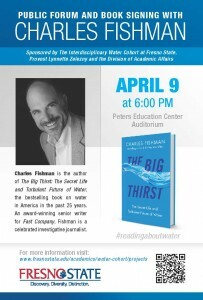 The Fresno State Interdisciplinary Water Cohort will host The New York Times bestselling author Charles Fishman, who will speak at a public forum at 6 p.m. Thursday, April 9 at The Leon S. and Pete P. Peters Educational Center on campus. The event is free and open to the public. Visit http://www.fresnostate.edu/academics/water-cohort/ to learn more about the Cohort.